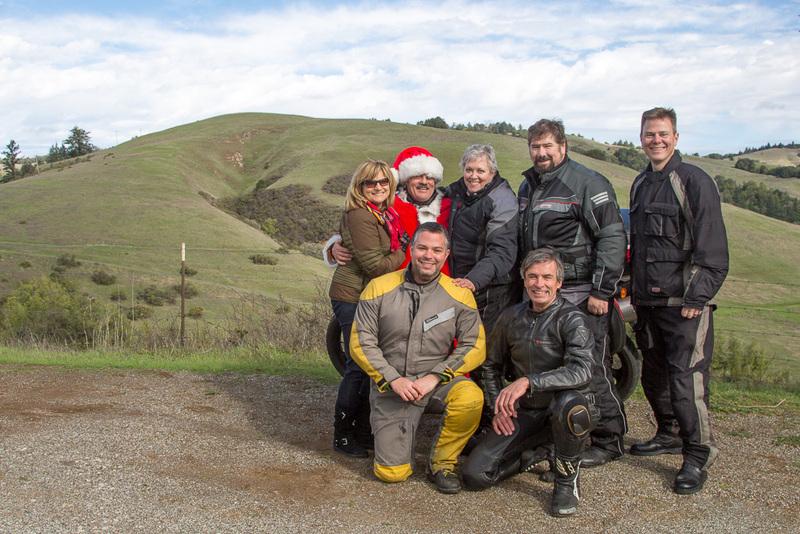 Last year was the first year I was able to attend the South Bay Riders’ Toy Ride. 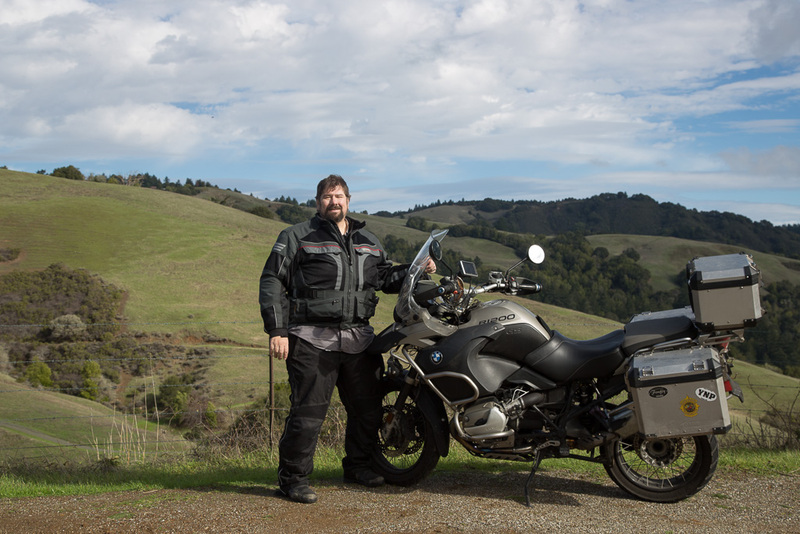 Mike, a longtime motorcyclist here in the Bay Area, organizes this ride. Each rider is to bring a new, unwrapped toy for the Toys For Tots program. 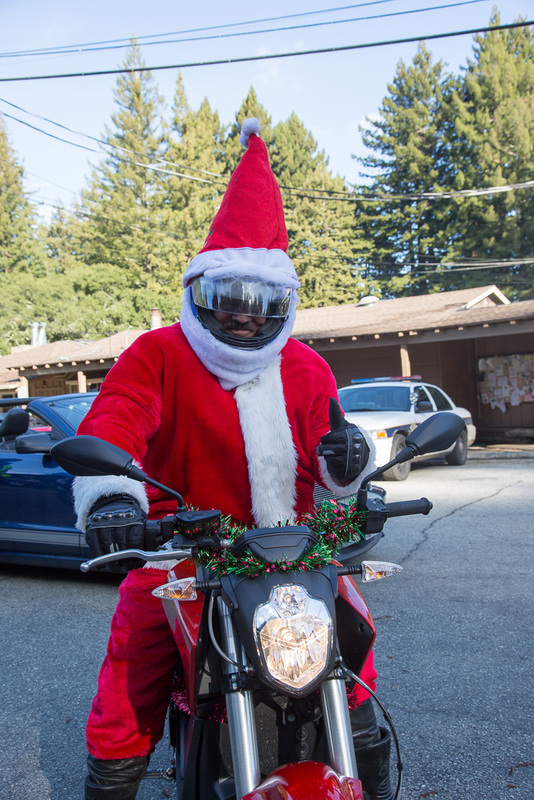 Some riders come out in full regalia, others with a touch of Christmas cheer, and all the rest of us enjoy helping others while riding our bikes. Wintertime in California brings our wet weather season. Just before the ride was Stormageddon, also known as the Rainpocalypse. With the media these days everything becomes a sensational story. In all of the other 49 states, our storm of the decade would’ve been a byline – “it’s raining on Thursday.” But, since California doesn’t get much rain becomes the leading headline. Truth be told, it was a strong system. High winds prevailed that day in several areas got more than a few inches of rain. The freeway was flooded out that connects my house and work. “Winter” has truly come to California. The night before some friends of mine had a really fabulous Christmas party. 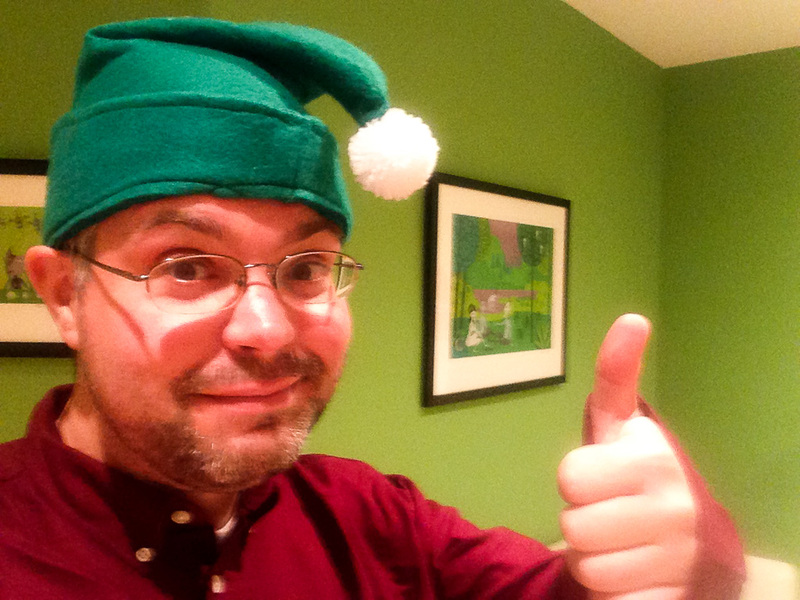 Since it was likely I was going to miss last year’s Christmas, a few of my close friends coined a new holiday, Dans-mas. The first Dans-mas coincided with Canadian Thanksgiving as I was planning to be overseas during Christmas and my friends wanted to surprise me. This year, time got away from all of us so we decided to celebrate just before Christmas. As good parties go, I was up late enjoying the evening with close friends. The next morning 8:30 came early. A couple of presses of the snooze button and I was already running late. Jumped out of bed, grabbed my riding gear and toys and was out the door by 9:30 a.m. – the start of the ride time. Heading down the freeway at a pace close to that of Blitzen, I realized it was the perfect December morning: sunny, crisp, and clear. 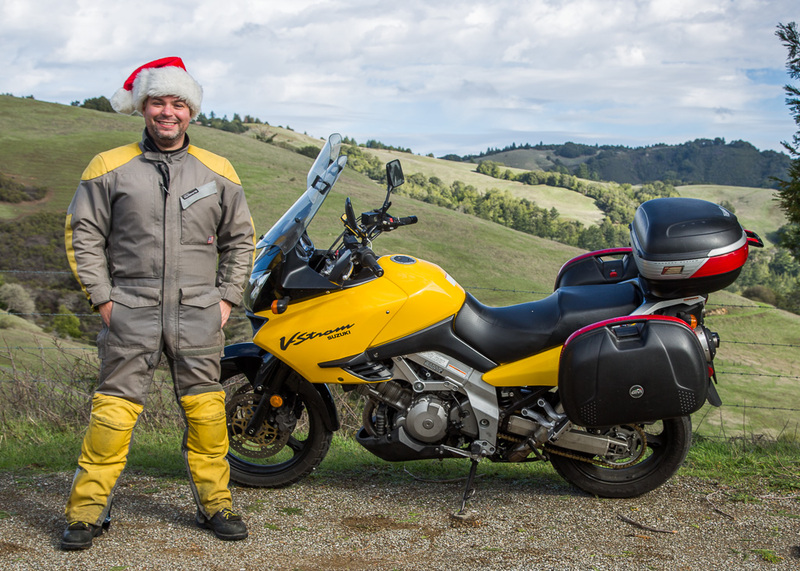 A number of things were running through my head but one thing was clear: I enjoyed incorporating motorcycling into my Christmas tradition. 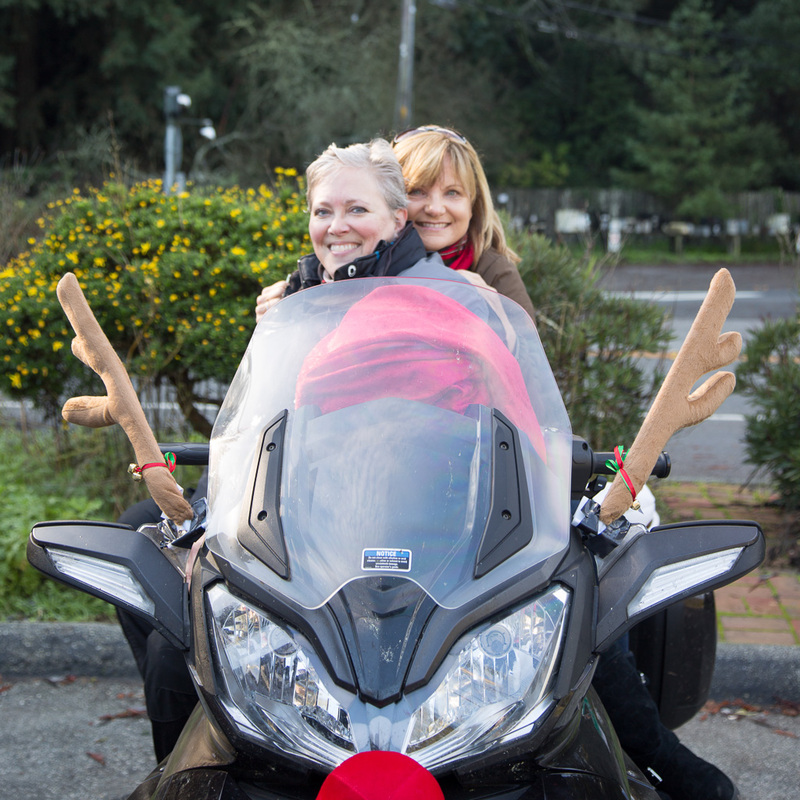 Last year I remember riding to Christmas dinner and really soaking in the moment, listening to Christmas carols all along the way. I pulled into Alice’s just as the toy truck was headed back down the hill. Sprinting in full motorcycling gear I caught the driver and asked, “is there room for one more toy?” He smiled, “of course!” Most of the riders were preparing to join the day’s ride but I was happy to mix and mingle for as long as people would talk to me. This year really has been a year of travel: moving to Sydney, moving back to San Francisco and the northern peninsula, as well as business trips to various places. I was amongst good friends I hadn’t seen in a very long time. It was truly great to hang out with Tyler, Scott, Ann, John, Tim… and many more of the South Bay Riders I know from the south bay. You know that you’re amongst good friends when things pick up right where they left off. There’s no ramp up time. You instantly jump back with the intensity you had when you regularly enjoyed one another’s presence. My practice of friendship this year has really changed. Being so many places I’ve really come to learn to enjoy the moment and those around me in that moment regardless of tenure in one another’s lives. In a lot of ways today reminded me of how many good people I do have in my life even if were not as physically close as we used to be. For that, I’m truly blessed. I never tire of hearing my name yelled out ”DAAAAAAN” followed by a big hug and rich conversation. 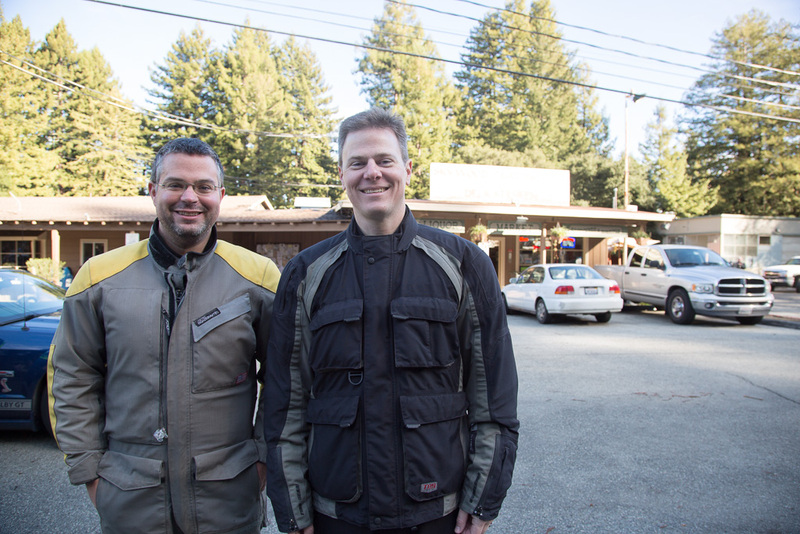 Andy, the founder of South Bay Riders, suggested I join them on a casual ride throughout the Santa Cruz Mountains. I could feel the pull… There was stuff to do back home. I was reminded “be open to the world” as the stuff back home would still be there upon my return. I mean, this was Andy 🙂, not an invitation that comes every day. Plus, there was Tyler, Scott, Sue, Al, John, and others I had yet to meet! The initial ride down Highway 84 showed a very different picture of the storm than I’d seen in the Bay Area. The trees in this area showed some significant damage as well as mud runoff all over the roads. Even the normally fast riders took today at a slower pace. Pine straw cover the roadways as well as mud in many corners making the pavement surface quite slick. 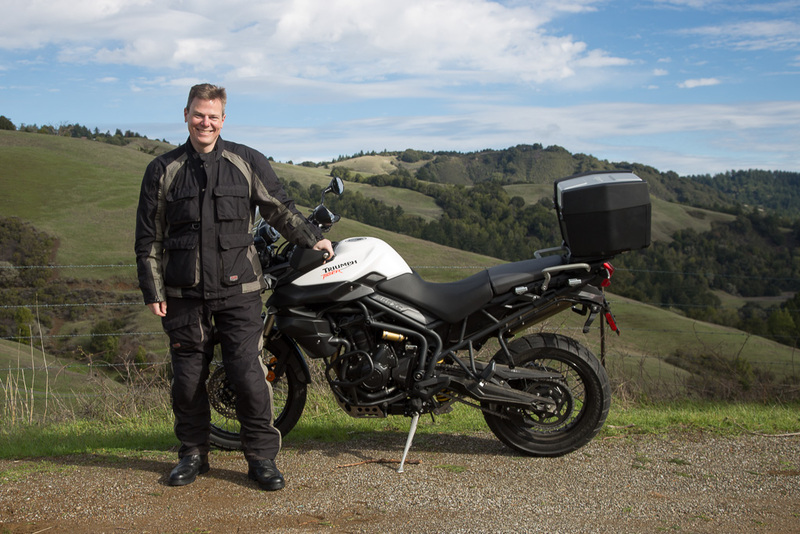 We call these rides “True Grit” rides as it brings out the hardest, and best in motorcycling. All we needed were the skies to open up and start raining to complete the Grit ride. 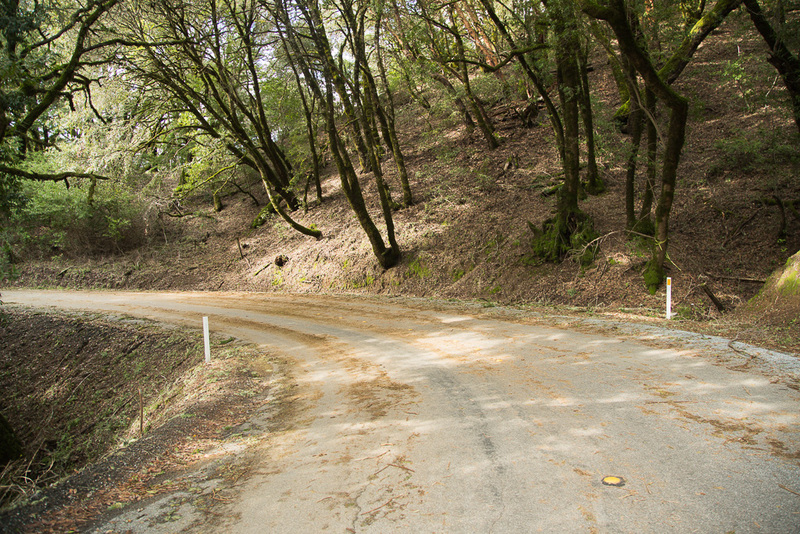 Alpine Road joins Pescadero Road at the edge of the redwood forest. In motorcycle communities you’ll hear “there is cold, and cold on a motorcycle.” This moment was different. Yes it was cold, but we are amongst California’s stately, gentle giants. The prior rainstorm brought out the sweet smell of the forest. Pine needles scattered across the road added a softness to the ride not usually seen. Many of the local residents had fires going in their fireplaces adding the smell of Christmas in the air. A warmth slid over me in those few moments enjoying the forest in mid-December preparing my own mind and heart for the holidays. 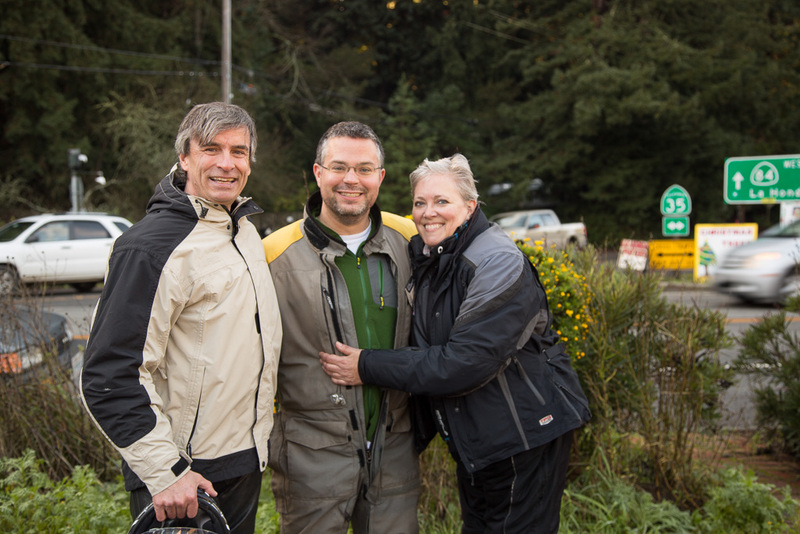 In a lot of ways it was the best of Christmas parties: we were enjoying the outdoors, each other, and helping others on our bikes all in the same day. In just a few moments later the character of Alpine Road significantly changes yielding rolling hills with open skies. The air was fresh and clear. The sun was out. Clouds dotted the skies. The prior storm’s wind blew this section of roadway clean. It was a great few moments of surfing asphalt. Andy has a secret spot where he takes his classic “South Bay Riders” photograph. We all stopped there and took portraits as the light was just perfect. I’m so glad I had my SLR camera! Andy is known for coining the phrase “wheelie for safety!” Being on such a small bike, it was significantly harder for him to pop the wheel like it is on his GSXR 1000. 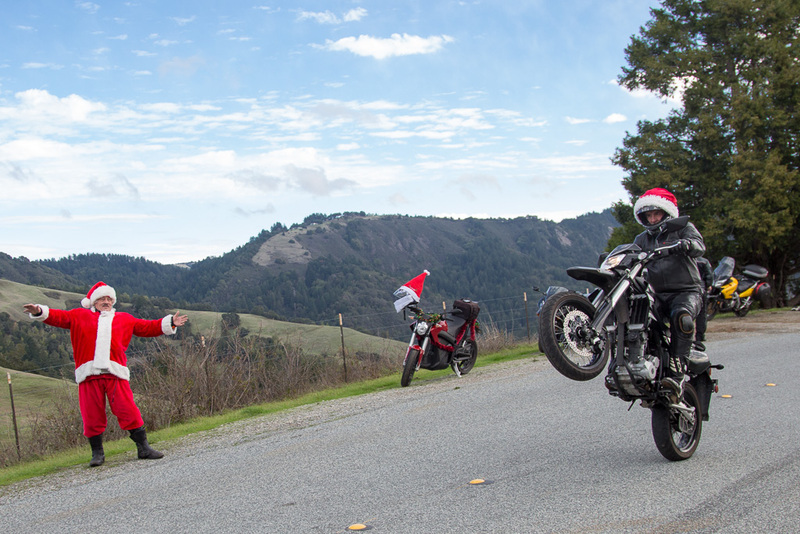 This time though, it was “wheelie for Santa!” After a few attempts, the wheelie, the camera, and Santa all converged for the perfect photograph. After we were all happy with the photographs, everyone headed their separate ways. It took me by surprise though that I was headed north and everyone else was headed south. It reminded me of the changes in my life over the past couple of years. Sure, I don’t live in San Jose anymore but a lot more has changed in life. This moment reminded me of that. It was a mellow ride back home. 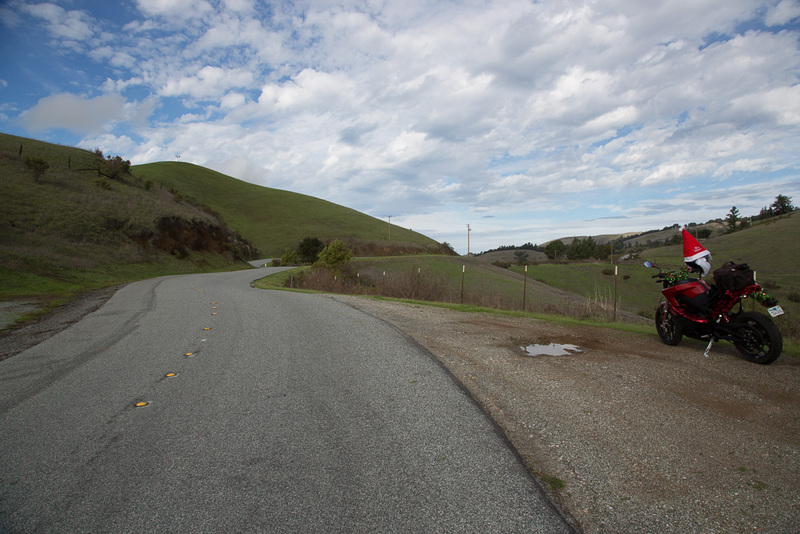 I took my time enjoying the Skyline Hills – roads I’ve not ridden in a very long time. Even here, the area was filled with Christmas. A number of cars had Christmas trees on top of them. As I was riding I could see local businesses and residences with brightly colored decorations peeping through the trees. Even in California, the land of eternally good weather, celebrates the famous winter holiday in style. I don’t think Bing Crosby would miss the snow of his White Christmas if he lived here. 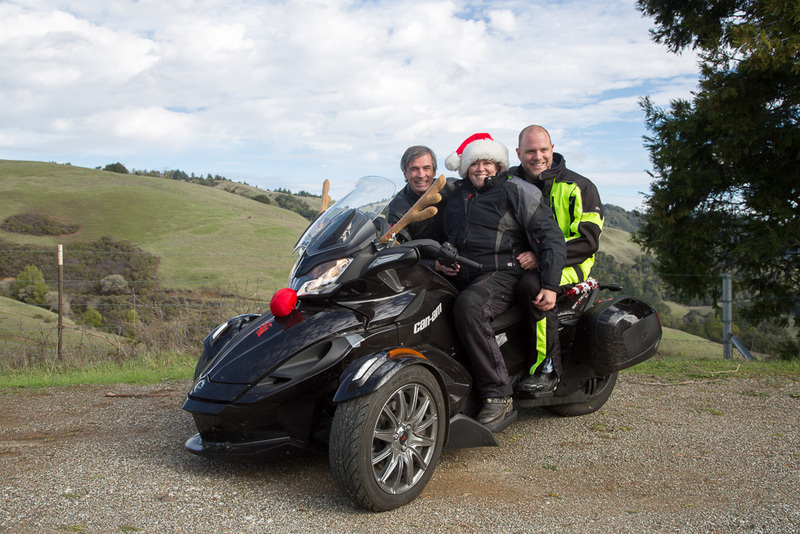 Elton John sings that we step into Christmas but this year I’m glad I was able to ride into Christmas! Merry Christmas everyone! Thank you for each of your presence in my life and all the best to you and your families in the coming year.